Tokyo, February 7, 2014 - Fuji Heavy Industries Ltd. (FHI), the maker of Subaru automobiles, has just unveiled the all-new Legacy (US specifications) at the 2014 Chicago Auto Show currently being held in Chicago, United States. The new Legacy ushers in the sixth generation of its model, a full 25 years since the first generation Legacy was released in 1989. A shared universal value among the past models of the Legacy is the strong, unwavering trust built up between driver and car. Over the course of the past quarter century, Subaru has consistently sought out a presence and value commensurate with its flagship model. We have purely focused on developing the kind of vehicle that acts as a partner to enrich its owners' lives. In order to further solidify the trust we have built up, in the new Legacy, we took this sentiment beyond just functional values; ride quality, environmental friendliness and safety performance such as the new “EyeSight" and Subaru's first rear radar system. We also brushed up its very essence—the design and quality at the core of its emotional value. The Legacy's polish gives it universal appeal as a true sports sedan providing trust-inspiring driving excitement, an inspiration to drivers to dream bigger and imagine a fuller lifestyle. “The Fusion of Design and Engineering at a High Level"
Since its inception, the Legacy has continued to consistently offer drivers sportiness with value. This makes the Legacy enjoyably less stressful to drive in all situations and gives drivers the exhilarating ability to direct the car exactly where they want. 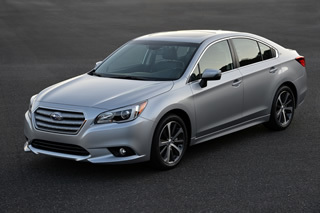 The product concept for development of the new Legacy was “The Fusion of Design and Engineering at a High Level." Subaru aimed for the high-level fusion of all the elements of sporty driving excitement. In addition to sharpening the basic performance essential to a Subaru sedan—ride quality, safety, packaging and more—all these elements were incorporated into the design. By increasing overall vehicle quality and producing emotional appeal, Subaru believes that a strong bond of trust between owner and vehicle can be inspired with a vehicle that is a pleasure to drive. "Muscularity with Agility" was adopted as the design theme to create sportier and more refined styling for the Subaru flagship sedan. Maintaining the design for the spacious, comfortable cabin space the Legacy is known for, the styling focuses on a sculptured body evoking a sense of safety and a strong base which grips the road with AWD. A body-integrated hexagonal grille and hawk-eye headlights are the new face of Subaru. Also, the dynamic character lines on the body side and tight, expressive body surface further raise the class for an already classy sport sedan. The front end employs a nose cone design. Due to the three dimensional shape beginning with the front grille, more dynamic design has been achieved. The rear combination lamps have the same design motif as the front in pursuit of a fearless image, front to back. Also, LED lamps are employed for the tail and brake lamps to help enhance fuel economy, and optimal light distribution has improved night visibility. "Comfortable and Sporty" was adopted as the design theme to dramatically improve quality and comfort, while creating a next-generation interior offering a sportier driver's area and an infotainment system for a more enjoyable in-car experience. The cabin is configured for a comfortable long driving, striking a balance between openness and secure feeling with adequate forward space. Also, the wide dashboard has horizontal highlights to give an even wider feel. For the interior colors, there are a sporty black and an ornate ivory configuration, meant to provide appeal with a cabin combining driving excitement with comfort and quality. In the black interior, silver highlights have been added as a base tone to create a horizontal design in the black trim, creating a tight and sporty, yet spacious feel. Meanwhile in the ivory interior, ivory spreads horizontally throughout for a sporty, yet bright and elegant feel. The head unit has a navigation system and audio with intuitive touch operation. A wide, flat center display* is employed to allow passengers to enjoy various media and provide them with various information. Also, consolidating information onto one screen makes it easier to see and use. The Harman/Kardon speaker system has exclusive audio settings for uncompromising acoustics, even at the base grade by optimizing each unit. The gauge cluster features a dual-dial layout with a three-dimensional feel and integrated color LCDs for greater presence and sporty impact. Blue-ring illumination of the meters in the top-grade models emphasizes the sporty feel. The cabin has been made more comfortable with more breathing room. Visibility, cabin space and our world-class safety have been kept in a highly efficient package with strong, sporty styling and a bright, spacious feel. While increases to basic specs were kept in minimum and maintaining the same external dimensional feel, certain aspects were refined, such as thinner frame of door sashes and a revised body frame of its roof to achieve ample roominess. Shoulder, elbow, waist and rear leg room in particular have been increased for a more comfortable cabin and further increased safety. The A pillar has been moved forward to expand the cabin area. In addition, front quarter windows were added with door-mounted side mirrors to reduce the front blind spot created by the side mirrors for increased forward visibility. All this has further enhanced safety and made the cabin feel more open. Passenger hip points have also been revised to be higher for natural seat positioning than the previous one with an open vantage and better views. Space between the driver and front passenger seat has been widened to enlarge both the center armrest and console box. Also, space when seated was expanded, and the door sash frame and sun visors were thinned. All these changes go towards keeping the cabin open and less confining. Space for the rear seats has been made more comfortable by expanding the tandem distance, changing the front seat slide rail construction to expand rear seat legroom. The chassis, steering, suspension and brakes were totally revamped for performance a head above its class. This pursuit of performance offers even more balance between steering stability and ride quality, achieving a higher quality ride. Increased rigidity of the body and suspension mounting positions suppresses roll to achieve higher ride quality without sacrificing suspension smoothness. The pursuit of performance through reduced suspension operating friction plus improved efficiency due to a basic layout that enhances stabilizer efficiency, combined with optimization of the front struts and rear shock absorbers, takes steering stability and ride quality to a whole new level to achieve ride quality a rank above its class. STABLEX-Ride has been employed for premium grade models. New valves and larger diameter front strut cylinders have improved damping response at low piston speeds and permit damping suppression at high piston speeds, resulting in even more stable steering stability and comfortable ride quality. To improve the dynamic rigidity of the rear suspension and its mounting positions on the chassis, the shape of the rear support sub-frame has been completely renewed and redesigned to function as a member that enhances body rigidity. This achieves better ride quality and less vibration in the floor and seats. The steering system employs a small, lightweight, high-powered control unit built-in the electric power steering. This, along with increased motor output and finer motor controls, achieves an accurate and natural steering feel. The steering wheel was designed using a highly rigid core metal, and the steering column was lightened to ensure a solid, quality steering feel. Active Torque Vectoring achieves superior turning performance and steering response. With the brakes, we worked to produce predictable brake feel which balances responsiveness, control and rigidity. Building the electronic parking brake (EPB) into the rear caliper makes the system quieter and more responsive. For the wheels, the bearing size has been enlarged as all models have a PCD of 114.3 millimeters. This modification greatly enhances rigidity while reducing weight for increased steering stability and ride comfort. The aerodynamic designs also help to improve fuel economy. Mid-range torque was raised on the FB25 Boxer engine, meaning more control and a lighter feel in practical driving ranges. Also, significant changes revolving around the intake, exhaust and combustion systems have improved fuel economy. While keeping the same basic structure from the previous intake manifold and tumbler generation valve (TGV), TGV valve position and intake port shape were given a simpler orientation. These changes balance volumetric efficiency in higher engine speed ranges with efficient combustion in lower engine speed ranges, improving both power and fuel economy. The intake sound has been tuned to produce a pleasant, congruous engine tone. Subaru continues its many years in honing performance from its EZ Boxer engine, working to improve fuel economy by employing the high-torque-compatible Lineartronic. The ECU is employed with a lighter next-generation microcontroller, which allows for further environmental measures. Power and environmental friendliness have been enhanced from the previous Lineartronic model for increased fuel economy. This also provides driveability with the smooth shifting the Lineartronic is known for and a light ride that always stays true to driver intentions. Friction within the transmission has been reduced for improved fuel efficiency, and a vibration noise reducer has been added to enhance ride quietness. New step shift control retains the shift-shock-free smooth acceleration that is characteristic of Lineartronic transmissions, while increasing vehicle and engine speed and providing a nimble ride that responds directly to driver intentions. With the standard paddle shifting in the six-speed manual mode, the driver can select the optimal gear quickly without taking their hands from the wheel, even under sudden deceleration or heavy acceleration, for an enjoyable sport driving experience. By adopting the high-torque-compatible Lineartronic for 3.6-liter Boxer engine, both driveability and environmental friendliness have been achieved at a high level. Compared to the previous high-torque-compatible Lineartronic, torque converter, oil pump and forward-reverse mechanism were newly designed while employing a new shifting controller for enhanced driveability and ride quietness. Building on a strong body frame base, both the traditional active and passive safety performance have been further advanced for improved omnidirectional safety performance. In addition to the New EyeSight, Rear and side visibility support features comprising Blind Spot Detection (BSD), Lane Change Assist (LCA), and Rear Cross Traffic Alert (RCTA) as well as Steering Responsive Fog (SRF) lamps that move to maintain good visibility to the front as the vehicle rounds a bend have been added to dramatically improve preventative safety and driving load-reduction. New EyeSight incorporates fully revamped stereo cameras that increase the view angle and view distance by approximately 40% to further improve preventative safety and driving load-reduction features such as pre-crash braking and adaptive cruise control. SRF automatically turns on the fog lamp on one side during cornering to improve visibility when cornering at night. In consideration of oncoming vehicles, this function can turn the fog lamps on and off according to the steering angle and driving speed. BSD flashes LEDs to alert the driver to vehicles in the blind spots behind the C- and D-pillars to the rear. If the driver operates an indicator to change lanes while a vehicle exists in a blind spot, LEDs in the door mirror flash to warn the driver. If the driver operates an indicator to change lanes while a vehicle is rapidly approaching in an adjacent lane, LEDs in the door mirror flash to warn the driver. RCTA emits an audible warning sound if it detects the danger of a collision due to a vehicle approaching from the left or right while reversing. If a vehicle approaches from the left or right while the driver has selected reverse gear and is reversing, the driver is alerted by LEDs flashing in the door mirror, an icon displayed in the rear-view camera monitor, and an audible warning sound from the speedometer. 980 MPa-class high-tensile steel is used effectively in more areas where body strength is required to reduce weight while achieving world-class safety with respect to impacts from the front, side, and rear directions. Performance has been raised for the seats and seatbelts in terms of basic performance, equipment and specifications for a balance between comfort and safety. The side airbags have added an all-new two-chamber system, with the chest and waist sections split for safety. The protection area for the curtain airbags has been expanded to enhance the performance for preventing passengers from being ejected from the vehicle during a rollover. Seat cushion airbags reduce tightness in the chest and waist areas to help the seat belts to better restrain passengers in the case of front collisions.